The Responder Safety Learning Network is the single largest online hub for first responders to get free training and resources in roadway incident response. Once users register for the network, they have access to a full range of roadway response training and can earn certificates of completion that carry CE credit. Registered users on the Responder Safety Learning Network can opt to have their tested training results reported to organizations with which they are affiliated. The organization uses a secure login to view the training results. Secondary reporting allows organizations to verify that training has been completed and frees the user from providing paperwork to prove completion. What is the secondary reporting program? The Responder Safety Learning Network offers organizations the opportunity to have their members' training results reported directly to the organization through the Secondary Reporting Program. Once an organization is on board, each designated supervisor receives an administrative login to securely access the training results for its members. From that page, supervisors can search, view, and download the module completion information for members who have opted to have those results released. Why become a secondary reporting organization? Secondary reporting allows the organization to closely monitor its members' training progress, easily verify course completion (and CE credits earned), obtain proof of training for certification and continuing education requirements, and import the data into other programs. Members no longer have to print and submit certificates to supervisors; the electronic verification is automatic and supervisors can be certain the modules have been completed. Secondary reporting also enables the organization to provide independent verification to oversight bodies, government officials and the public that its members are completing training on critical safety and response practices. The training on the Responder Safety Learning Network is free. When an organization signs on to become a secondary reporting institution, there is a one-time $495 fee. How does an organization sign up for secondary reporting? An organization completes and signs a simple form and agreement to join the program. Once an organization is on board, the Responder Safety Learning Network provides support materials on the use of the system and on how to promote the training to members. Who do I contact with questions or for further information? Please use the form on our Contact Us page and, in the Comments field, indicate that your organization is interested in participating in secondary reporting. You will then be contacted with more information about the program. 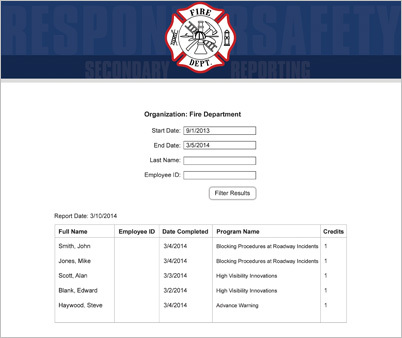 How does a Responder Safety Learning Network registered user opt into secondary reporting? To opt in to secondary reporting, log into your Responder Safety Learning Network account, click "Edit My Profile," select the organization to report your results to, enter any member number required, and click "Update My Profile."